I’m going to let you in on one of the dirty secrets of veganism. This is the secret that I tell to people who find out that I’m vegan and immediately say: “Do you eat tofu? I tried it once and didn’t like it. I don’t know how you can eat that stuff!” Yes, tofu is a nutritious and versatile food, but even I have to admit that when prepared improperly, it can be squishy and bland. The secret to fabulous tofu this: It must be deep fried. Most people who try tofu do so for health reasons, so they might sauté it in a spritz of olive oil, toss it raw into soup, or bake it in the oven. These are perfectly respectable ways to eat tofu if you already like it. However, for the first-timers, you want that chewy, delicious, dense, flavorful tofu that holds its shape and beckons to you from your plate. The first time you try tofu, it must be deep fried. In my 10 years of vegan cooking, I have never been able to perfect the art of deep frying tofu in my home kitchen. I have repeatedly gone through the time-consuming process of draining, pressing, drying, slicing and frying my tofu. I have tried dusting with cornstarch. I have tried woks, cast-iron cookware and Teflon. I have used different kinds of oils of differing depths. I have used entire rolls of paper towels and set off more than one fire alarm. I had honestly given up hope of ever crafting restaurant-quality Asian meals at home. And then I learned about Thanh-Son Tofu. The Thanh-Son Tofu shop isn’t much to look at. It’s a local tofu factory located in the Pho Lien Hoa plaza on NW 23rd St. that makes fresh extra-firm tofu, silken tofu, soymilk, and Vietnamese desserts. The shop portion of the building is composed of a large, glass-doored refrigerator case, a table and chairs, and a cashier’s counter. One on side, there are ceiling-high stacks of boxes and unused plastic soymilk containers. A random assortment of Asian vegetables that I couldn’t name, appear to be for sale. Through a door behind the counter, you can glimpse part of the tofu factory in the back. This is where the magic happens. And by magic, I mean the deep frying. I probably never would have ventured into Thanh’s tofu store if I hadn’t come across a random internet message board claiming that they will fry their fresh tofu for you. You can go into the store, pick up a block, and for about $3 walk away with a bag of freshly-fried, golden, chewy soy goodness. It’s the restaurant-quality tofu with the crispy edges and creamy middles that I can never quite replicate in my own kitchen. This is the kind of tofu that I have dreamed about while attempting homemade Chinese stir-fries, Thai curries, or vegan pho but could never quite accomplish. 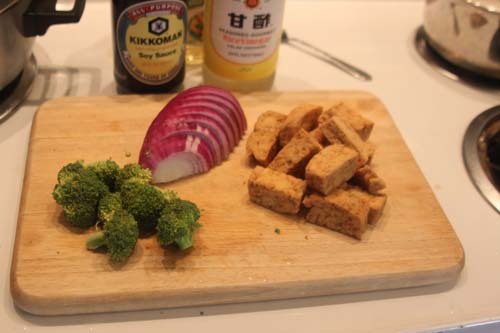 Now that I know about Thanh’s tofu, I foresee a bright culinary future for myself where I simply pick up a bag on my way home from work, and create a quick, Asian masterpiece for dinner. Not only do they sell regular plain tofu, but you can also select their lemongrass or black mushroom varieties. I didn’t even know that you could make flavored tofus! 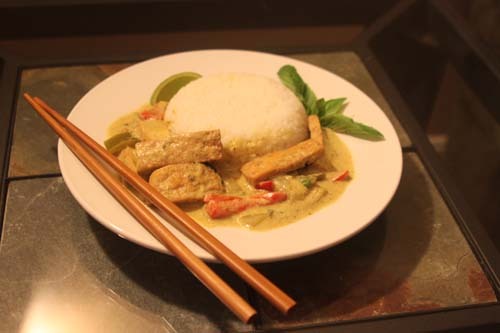 Why have I been eating plain tofu all of my life when I could have been eating lemongrass tofu? In the whole of my cookbook-reading, recipe hunting, Asian restaurant-frequenting life, why did no one tell me about this earlier? On the tofu firmness scale, Thanh’s tofu would probably be rated as extra extra firm tofu. The blocks are sold in plastic wrap instead of in water-packed containers like the ones at the supermarket, so they are drier and require less pressing and fewer paper towels. Without their protective water womb however, I’ve found that the blocks will go bad faster than the supermarket brands, so try to use it soon after you buy it. Alternatively, you can unwrap it and store it in water-filled Tupperware at home. Just be sure to change the water daily to prevent it from getting funky. It’s like a having a pet, only less exciting! Thanh’s also sells half-gallons of fresh soymilk in sweetened and unsweetened varieties. Though the soymilk tasted fresh and had a smooth consistency, it also had a distinct “beany” flavor that did not appeal to my Western taste buds. I will probably stick with the green refrigerated cartons of soymilk from my local supermarket, but Thanh’s soymilk did work just fine when I used it for cooking and baked goods. Their display case also features a large variety of brightly colored sticky rice and layered pudding desserts containing rice and beans. Though tempted, I did not try them. Most of desserts were unlabeled, and I feared that they might contain gelatin or dairy products and then I would lose my V-card. Adventurous omnivores, however, have many exciting and colorful options to pick from. Unfortunately, Thanh’s tofu refused an interview so I cannot tell you where they get their soybeans from, or if they are genetically-modified. However, for those people who prize local foods, this a product that you can pick up directly from the factory and take to your home. As someone who eats a lot of soymilk and tofu, if I sourced all of my soy products from Thanh’s tofu, it would be a significant contribution to the local food economy. On the down side, I have to admit that their customer service left something to be desired. However, for the sake of the amazing fried tofu, I’m willing to chalk it up to a cultural or language barrier. None of the staff that I interacted with spoke much English, so bring a translator, or don’t ask too many questions. Also, be sure to have cash on hand, because they do not accept checks or credit cards. You can also pick many of Thanh’s tofu products at the nearby Super Cao Nguyen market. 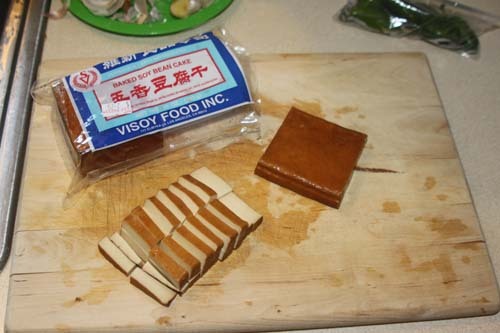 While you’re there, grab a block of Visoy’s bean curd. This tasty product is a little-known and hard to find soy creation. My girlfriend lovingly refers to this it as “bean turd” but don’t be discouraged. It is simply tofu that has been marinated, pressed and baked into a small brown block. With the water removed, the bean curd has a smooth, dense consistency that is very similar to cheese. I like to chop it up and sprinkle it in salads, or wrap it up in spring rolls or sushi. Thahn-Son’s will most likely never win a “Best of OKC” award, or get a review in the Oklahoman. It’s one of the many little delicious secrets of the Asian district. For those of you who are adventurous enough to visit, you will be richly rewarded with perfect fried tofu. From now on, when I dream of golden fried tofu, I dream of Thanh’s. Tagged chairs, interview, language, NW, OKC, options, Pho Lien Hoa, reading, Super Cao Nguyen, Thahn Son, Thanh Son Tofu. Bookmark the permalink. I’m not a tofu lover, but this is great info to know! This sounds amazing! And that bean curd sounds like a must-try! Thanks for writing this. I love tofu too and now that I know there’s somewhere to get it fresh I’ll have to check it out. Also, I’ve gotten that bean curd in the Pad Thai from Pei Wei and had no idea what it was, but it is delicious. I have been going there for many years, and I finally have gotten them to warm up to me. She smiles now and laughs and talks to me! It made my day when we had this “breakthrough”! Thanks for sharing. Oh! Also, I have had carnivorous tofu haters at my house for dinner who couldn’t stop eating the tofu off my cutting board before dinner was ready!